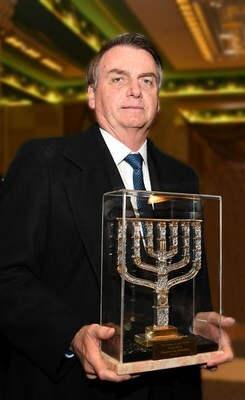 JERUSALEM, April 1, 2019 /PRNewswire/ -- Today in Jerusalem, the Friends of Zion Museum hosted the Brazilian delegation and bestowed the "Friends of Zion Award" unto President Jair Bolsonaro of Brazil. The Friends of Zion Museum presents the "Friends of Zion Award" to world leaders who have gone "above and beyond" for the State of Israel. Upon his arrival, President Jair Bolsonaro met with Israeli Prime Minister Benjamin Netanyahu. In the FOZ Museum, Prime Minister Netanyahu is quoted saying "I don't believe the Jewish State and modern Zionism would be possible without Christian Zionism." President Bolsonaro and Brazil's friendship with the State of Israel speaks to the Friends of Zion's message, saying that his government is "determined to strengthen the partnership between Israel and Brazil." In the past few months, President Bolsonaro has reaffirmed his support of the State of Israel. He has also confirmed his commitment to strengthening relations between Brazil and Israel, subsequently announcing that his country will be opening an Economic Mission in Jerusalem, Israel's capital. The Friends of Zion Museum recently surpassed 58 million members, making it one of the largest pro-Israel sites in the world. According to Dr. Mike Evans, "amongst the 58 million social media friends we have, millions of its supporters come from Brazil, which is the fifth largest nation in the world." 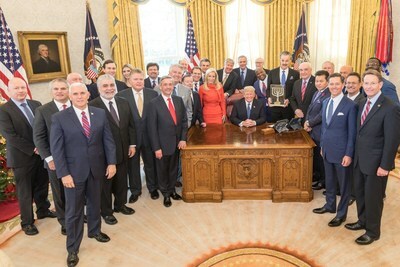 Previous recipients of the Friends of Zion Award were President George W. Bush, the Crown Prince Albert II of Monaco, President Rosen Plevneliev of Bulgaria, and President Jimmy Morales of Guatemala for their unwavering support for the State of Israel and Jewish people. The Friends of Zion Heritage Center is a $100 million-dollar project that has become one of the central institutions in the State of Israel influencing the world and strengthening Israel's relations globally while fortifying the pillars of Israeli society.